Making your WordPress or Joomla website mobile-friendly means more than accommodating your website’s visitors. Back in February we took a look at how Google is considering how your blog serves content when it comes to ranking websites. Many of the criteria are related to mobile devices. Today we will consider in more depth different strategies that can help you optimize your blog with mobiles in mind. The first step in fixing problems is recognizing that they exist and pinpointing them. Google Lighthouse is an invaluable tool to find problems and start working on fixing them. The open-source tool examines your webpages, evaluating it based on various criteria that affect your search engine ranking. A priority area for Google is page load speed, which is just as well because it falls right in line with the priorities of your blog’s mobile audience. A quick, sure-fire way of reducing loading times is by reducing the size of the content that you serve. Each script, image, emoji or GIF that are in your webpage or blog post mean one extra request that the browser has to make to load the page in its entirety. In March, we saw how WP Speed of Light could be used to turn off emojis and Gravatar images, but removing content from your blog is not always desirable. A simpler, easier alternative is reducing the size of the files that are being served. Although requests still have to be made, the size of the downloads would be smaller, and thus they would be served faster. It turns out that solutions to this end are plentiful. WordPress plugins like WP Speed of Light can be used to drastically reduce the size of files automatically and in bulk. Images are usually the biggest resources in a webpage, and thus they are usually the focus of such plugins. Moreover, scripts can also be optimized by grouping them together - reducing the number of required requests - or by minifying them for a smaller size. On top of this, lazy loading is an increasingly popular way of improving page loading times. Lazy loading loads content - mostly images due to their sizes - if and when they are needed. Thus, the initial loading time is curbed significantly for image-heavy web pages because pictures that are not visible do not have to be downloaded right away. 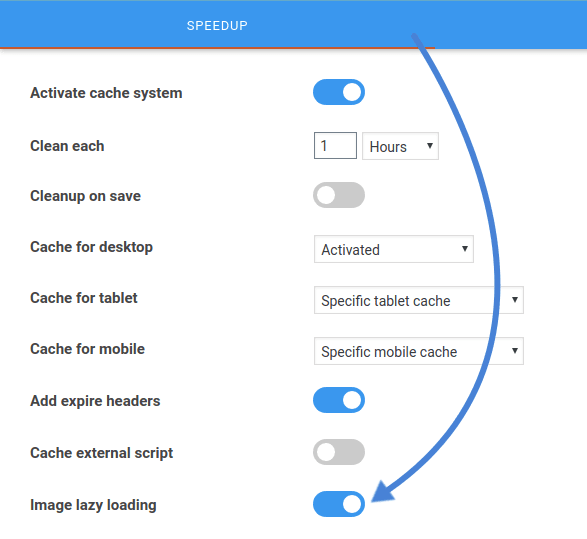 With WP Speed of Light, lazy loading can be enabled with a single flick of a switch. If you want to an even more elegant solution, then rethinking the whole idea of your blog can also be an option. Google Lighthouse is not the only SEO tool from the search engine giant. Another open-source initiative is the AMP Project, short for Accelerated Mobile Pages. This framework is a layout defined by Google that allows the search engine to exploit the HTML structure to serve pages faster. Pages that conform with the AMP Project are cached by Google, which means that they are served much faster than regular pages on smartphones and other mobile devices. Unfortunately, it also means that as WordPress webmasters, you would also have to adhere to Google’s strict standards. A less drastic solution is to use a mobile-ready design on your WordPress blog. Google no longer takes kindly to mobile-only websites. These webpages are distinct from the original website and designed solely for mobile devices. Thus, these webpages are served when the server realizes that a webpage is being accessed from a mobile. Such websites are clunky at best, often requiring one or more redirects. These issues result in - you guessed it - slower loading times. The modern, preferred alternative is to use responsive design. Think of responsive design as a stylesheet that adapts to whatever device is being used on the fly. To exploit this facet of web design, ensure that your blog is using a responsive template. If you prefer, alter and hone your stylesheet yourself so that the same design is used across all imaginable devices - elegant, efficient and fast. If you take a good look at Google Lighthouse’s output, you will find that many factors boil down to user experience. Taking a closer look at the feedback by Google’s SEO tool helps you isolate problems that your readers experience on your WordPress or Joomla blog. Chief among them are the interactive elements, and how long they take to load. For example, if you are displaying pop-ups, it is imperative that they can be closed immediately using easily-accessible options. Other ideas to consider are the inclusion of accessibility-friendly elements, such as alternative tags for image. Overall, these are factors that do not improve only your mobile readers’ experience on your blog, but affect your whole readership. As the connected world converges towards portable devices, so will your readership. As a journalist, blogger or an artist using WordPress or Joomla to showcase your work, attracting and retaining readers is invaluable. Now that even search engines are prioritizing mobile-ready websites, it is time for you to shift your attention as well.